Last week, students participating in the Fundamentals of Neurocognitive Science elective, visited two Orang Asal communities. Before the visit, the students were tasked with a course assignment from Prof Zalina Ismail, to replicate and enhance the current Curriculum-In-A-Box, which is used in BRAINetwork’s Pusat Minda Mesra in the indigenous village of RPS Air Banun. The students worked hard over the past few weeks on the new boxes which will replace the previous boxes that have been used by the local indigenous teachers over the course of the last school year. The students put in long hours coming up with creative enhancements and new material for the curriculum. The students presented their efforts to Prof Zalina and their fellow classmates last Monday. On the 12th of December, the students travelled to R.P.S. Air Banun to deliver the new Curriculum-In-A-Box to the Pusat Minda Mesra teachers. It was the first time for the students to visit the village and a great experience for them to see where their work over the past few weeks would be used, to see it’s practical application within a community setting. Next the students boarded a boat for Kampung Chuweh, the students travelled for 30 minutes taking in the scenic views of the Belum-Temenggor Forest Complex on route. Upon arriving, the students went to meet Gomba, the head of village, who was sitting at the village’s small crafts shop. The students chatted with the headman and the other villagers present as they learnt about the Orang Asal’s way of life. A number of the students purchased small gifts/souvenirs from the village’s handicraft shop. The students then began engaging in some activities and games that they prepared for the children of the community. The students and children done some colouring together, before the students taught the children some ball games which they played together. Next it was the turn of the Orang Asal to teach the students, with the women of the village teaching some handicraft skills to the visiting students. The villagers had sourced some duan nipah nearby which they used to demonstrate their weaving skills, as the students and Orang Asal made hand-woven crowns together. 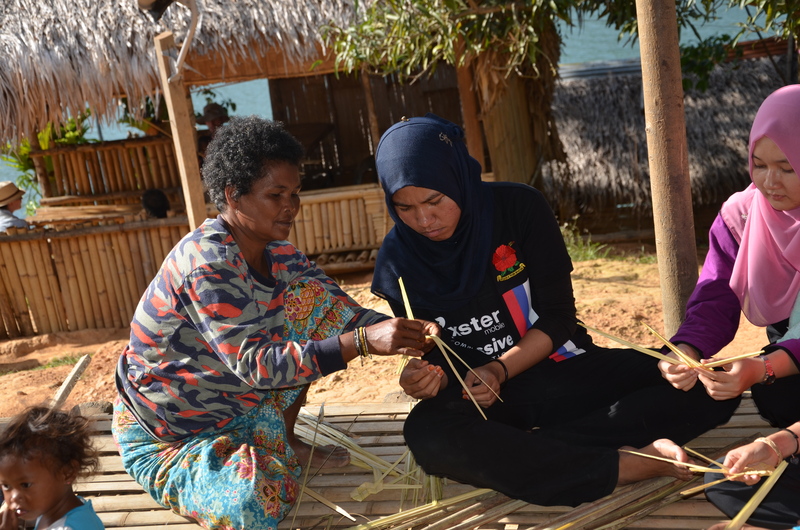 Gee Bunga Raya, one of the students who visited Chuweh, said that “I really enjoyed the experience, I had no idea what the Orang Asli villages would be like, people in Malaysia need to be more aware of the Orang Asli”. Thank you, to Gee and her classmates for their efforts in their elective, and also to our Irish friends, Katie and Liam, who joined us on our visit to R.P.S. Air Banun and Chuweh. Ayu and Hazirah, modeling their new hand-made crowns. Reblogged this on Our Summer School .